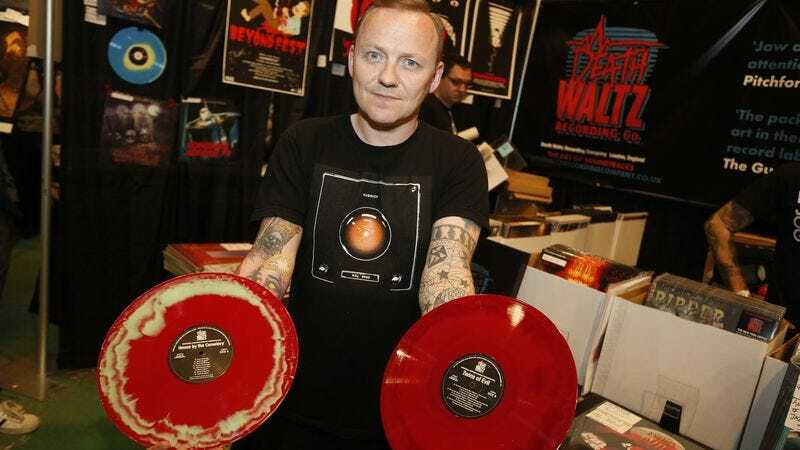 The mixer: A longtime manager of London’s venerable Rough Trade Records and the organizer of Record Store Day in the U.K., Spencer Hickman combined that passion for collecting vinyl with his lifelong zeal for horror movies by founding Death Waltz Recording Company, a label that has quickly established itself as the premier source for reissues of cult soundtracks from everyone from John Carpenter to Fabio Frizzi. In its three years of existence, the Death Waltz name—which recently combined forces with the similarly minded Mondo in the U.S.—has become an imprimatur of the highest quality among film score collectors, a guarantee that even the most ghastly of slasher or exploitation flicks will have their soundtracks rendered in pristine audio, folded inside packaging bearing museum-ready works of art. For your Halloween playlists, we asked Hickman to give us 13 selections from his favorite horror film scores. Spencer Hickman: I really love Zombi Holocaust, because it is one of the most ridiculous, cheesy, Italian rip-offs. And I’m sure that lots of people pass over the music because they think the movie’s a joke. But Fidenco’s score is incredible. It’s this amazing mix of really wistful, melancholy psychedelia and electro. It is like living in the future—or like New York in 1983. The Italians were always putting things on their soundtracks that were completely different from anyone else in the world. They didn’t really have any constraints, whereas American and British soundtracks were very orchestral and overblown. The Italians were just throwing disco, samba, and $20 keyboards into the mix and sort of not really caring. “Living In The Future” is really simple and it’s obviously just built around a drum preset, but it’s got this fantastic atmosphere. And you know, I’m off to Helsinki to DJ today, and people always ask, “What do you DJ? Because you, like, do film scores.” But something like this is the perfect thing, because you could play that anywhere and people would come up and ask what it is. It still sounds really fresh, like it literally could have been recorded and released this week. SH: I mean, it’s Godzilla. What can you say? The music is just incredible, and it just captures the mood of the film perfectly. And as a stand-alone piece of music, it’s just fantastic. It’s got that military-style propulsion on the drums, the trumpets and stuff—just a real hot air of horror about it. It sounds like impending doom when you listen to it. For me, you can’t ask for more in a main theme to a movie. And it’s Godzilla. [Laughs.] It was a pretty huge dream come true when we found out that we could actually license and release Godzilla. That’s one of the earliest movies that I remember seeing, and it left a huge, huge impact. Not only on myself, but on everything that followed it, really. It was a real honor for us to be able to do that. SH: Hands down, this has to be one of the greatest scores of all time, horror movie or otherwise. I bought the Blu-ray of Cannibal Holocaust when it came out a couple of months ago and rewatched it. And obviously, the movie itself is very, very hard to sit through. It’s quite an ordeal even now. And yet the music is actually really, really beautiful. I sat there thinking that if this film had “traditional” horror movie music, it would be unwatchable, because it would be, absolutely, beyond brutal. The music actually offsets a lot of the violence that’s on-screen. And although it doesn’t make it easier to sit through, it’s like a counterpoint to this grueling visual. And Riz’s score is just a phenomenal mix of synths and orchestral pieces—especially on this piece, because that decay on the bass synth is just nuts. And you get these beautiful strings coming through. I don’t know how he scored this film, because I couldn’t imagine sitting down and watching this movie with no score, and saying, “Oh, I’m going to have this really beautiful song playing over the intro, and all this music is going to be really lovely.” I don’t know why he did it, but what he did is absolutely incredible. It’s a shame it couldn’t have been bottled for future films in years to come. SH: Legend Of Hell House is probably my favorite haunted house film of all time. Delia Derbyshire and Brian Hodgson were part of the Radiophonic Workshop for the BBC, and she recorded the best-known version of Doctor Who’s theme tune. They were doing interesting stuff with loops, tapes, etc., years before anyone else and creating really, really crazy music at the BBC. This music’s very odd, because it’s an early ’70s movie, and the score is just total electronics and very ominous synths and tape loops. Certainly ahead of its time—and certainly very, very upsetting that none of the original tapes exist anymore. I just rewatched this last week—I just bought the Blu-ray that came out—and the music adds a really nice mood to it. It’s also music you wouldn’t expect to be on a movie from that time period. You’d think it would have a Hammer-like, big orchestral score. But it’s just these two people messing around with synths and tape loops. Which adds to the movie, because it’s very otherworldly. This could come out today on Warp Records and people would be hailing it as a masterpiece. The A.V. Club: I don’t know if this a song that, if it came out today, people would hail it as a masterpiece. SH: [Laughs.] No, they wouldn’t. But, again, I really love Sleepaway Camp. It’s quite an outrageous film. Obviously, the final scene—no spoilers, in case people haven’t seen it—but that final scene is still shocking today when you see it, and it’s a fairly audacious thing to pull off. There’s some borderline stuff in there you would not get away with today, like the camp counselors talking at the beginning about the young campers coming in. It’s quite outrageous. It’s funny, because there were lots of songs like this around that period in the ’80s—especially in American movies—like Dokken doing “Dream Warriors.” Nightmare On Elm Street is notorious for having terrible, terrible theme tunes, like the Fat Boys, etc. And this is one you would think would be lumped in there, but it’s not. It’s actually a really, really good song. AVC: I read in an interview that, when they had Vinci write this song, they gave him the Sleepaway Camp script, but they didn’t give him the last page, so he had no idea how it ended. SH: There’s certain people from Italy that you have to include, and I think Alessandro is one of the people that are fairly unsung and not that many people talk about it. You’ve got people like Finders Keepers who championed his stuff, but he’s not widely known. Which is weird, with the kind of Italian explosion that’s happened over the last few years, with Goblin, Fabio Frizzi, and even Fidenco, so I don’t really understand why. But Killer Nun, the score is just absolutely fantastic. It’s got this otherworldly sound, and the effects that he got, no one else could do at the time. To me, it really stands up. It’s a quite intense score as well. He’s just someone, just for some reason or other, people don’t really talk about. I’d like to see that changed. AVC: That’s kind of like the nunsploitation genre itself. People don’t really talk about it much either. SH: Yeah, maybe that’s the problem. It’s a great movie though! It’s a bonkers film. You know, you think you’re going to get one movie because it’s called Killer Nun. But actually the stuff that goes on in there is quite odd and it becomes something else. It’s definitely a movie I think people should check out. It also probably doesn’t get as much love as it should. SH: This is from Rosso Sangue, which over here was called Absurd. And a lot of this score was used in Pieces as well—the American version of Pieces. Again, this is that electro-funk stuff that the Italians did so well, so much better than anyone else. And no one’s really ever touched it. This came out on CAM Records, on vinyl, as a promo years and years and years ago. It fetches now upwards of $500 or $600, because it was only like 100 or so pressed. It’s a record that lots of people don’t know because it’s never been reissued. But it’s… I don’t like to use the word, but it’s banging. [Laughs.] And again, it’s one of those that doesn’t get a lot of love and he doesn’t get a huge amount of press. This is probably the biggest film that he made and it’s just almost been forgotten. But people who know this score absolutely love it, and I’m really hopeful that we’re going to be able to release this at some point, because this definitely needs to be available by now. AVC: So is this one of the reissues you’re currently pursuing? SH: Yeah. To be honest, I think we’ve got it. It’s been on my list for ages and ages. The only version I’ve got is this kind of terrible bootleg. I don’t really know where it came from. The CAM one I’ve never been able to track down a copy, and the version that is online has got all the old click tracks as the intro, so I don’t know where that came from. But yeah, this definitely deserves to be a stand-alone release. AVC: Is that something where you had to contact Cordio himself? SH: I did. I contacted his wife, actually. She looks after all his business affairs. It’s been a year, and we’ve got to the point where we know where it is and everything should be A-okay. When I started at the label, I had a big list of stuff. Because I grew up in the U.K. in the ’80s, I was subject to the whole “video nasty” era, so I’ve got all of these fairly legendary movies on my radar from that time. And Absurd is one of them. When people say “Holy Grail,” this really is a Holy Grail. SH: This is another record that costs a ridiculous amount of money if you can find the original. Which, you know, good luck. Finders Keepers re-released it, and I was very, very jealous, because this is one of my all-time favorite soundtracks. But they did a fantastic job on it. It looks and sounds incredible. Nicolai was [Ennio] Morricone’s arranger for a long time, until they fell out over something and never spoke again, and then he sort of went out on his own. And he made just a wonderful, crazy soundtrack. It’s got everything going on. His arrangements are incredible. The vocals just don’t sound of this world. There are tracks on here that are such amazing little pop gems, and then there’s crazy wig-out psych jams. I can see this record appealing to people who are into mod stuff and psych stuff, and then weird Japanese pop fans like it, because the arrangements are so off-kilter. Nicolai had such an interesting ear and such an interesting way of doing things. SH: Claudio’s funny because he was always the star of Goblin. Anyone that saw them play the other year, in the version of Goblin that first toured America, would know that. Because Claudio loves being onstage, loves being the center of attention. He always felt to me like the person out that band that, when he was doing solo stuff, he kind of wanted to be a pop star. Anything from, like, [Enzo Castellari’s] The New Barbarians, were these kind of heavy funk tracks that you could imagine some girl wailing over the top. And “Demon” has just got this killer synth bass line where you can imagine—not that you’d want to—someone rapping over the top. He’s also got a great ear, and his production is fantastic. Although, some of his tracks are kind of dated. You can tell they’re from the ’80s or whatever. But he definitely has an ear for a beat. I imagine he’d be the first one on the dance floor at a wedding. SH: Oh man, I so wish more people knew this album and this film. Because both the soundtrack and the film are kind of lost classics, really. This has been on my playlist for years and years and years, and it’s one of the records that I always listen to at home. It doesn’t sound like a typical horror score. There are a couple of very concise, kind of wistful pop tunes on there, and then these kind of huge, 10-minute-plus tracks. And you can pick it up really cheaply secondhand, because the rights, no one knows where they fall anymore. I spoke to Colin last year and it’s just in limbo, this record. AVC: Isn’t this one that you were planning on re-releasing? SH: Well, I don’t know if we can to be honest. I don’t think we will, because rights-wise, it’s just all over the shop. I just think more people should know this soundtrack. The film as well—even if you just go and check it out on YouTube, which is probably the only way to get the movie. I don’t even think it’s on DVD anymore. Certainly not on Blu-ray. It’s a good movie to go and check out if you like a good ghost story—like a slower-paced ghost story. That proved to be the best move, because I have a really fantastic relationship with Fabio now, which is going on four years. I’m very, very lucky to count Fabio as a friend, but still someone that I absolutely admire. His scores for those [Lucio] Fulci films, they’re incredible. They just elevate the material. And this track is just one of those songs that’s got that killer, killer bass line, and it’s kind of ominous and uplifting at the same time. I’m really glad that in the last few years people have started to pay far more attention to him. He’s about to play another Halloween show in London at the Barbican, and there will actually be a U.S. tour next year, so people will get to see him play all this stuff live. And the thing with Fabio is he’s still working, and he’s got such passion for it as well. He’s got so much drive and all this ambition, and it really rubs off on you. He just wants to work and do stuff. AVC: What do you think it is about the Italians that they understand horror so well? SH: I don’t know! I don’t know what was in the water at that time. That’s the thing: All these scores from this time were so interesting. In the States, you’ve got [John] Carpenter, obviously, who used synths because he couldn’t afford to pay anyone to come in and do his music and it was the best way to do it. And guys like Tim Krog, with The Boogeyman. And then you’ve got the bigger studio movies, like The Omen, The Exorcist, with these big orchestral pieces. But in Italy, they just let them run riot for some reason. And I don’t know if it’s because the movies were made so quickly, on such short turnaround, that they just gave the composers free rein and didn’t even care—because by the time they’ve finished this movie, they’re on to the next two anyway. I mean, Fulci would make three movies in a year. But the composers were just free to do exactly what they wanted to, so you’ve got all this great mix of electronics and orchestral stuff. Which as I said, no one mixed that. No one did that in the States. They were kept really separate. But all these guys would throw in everything. If you listen to New York Ripper, which is a horrifically grim movie, the score’s got like loads of Latin funk on there. I can’t imagine that getting through in the States or in the U.K. I’d like to think it’s because the composers were just given free rein. It’s probably more to do with the time constraints. Whatever it was, that period in film music history is really, really rich, and I’m really thankful for that. SH: You can’t not have Goblin. They are the kings of Italian soundtracks. And for me, Suspiria is head and shoulders above anything else they ever recorded—and anyone else ever recorded as well. As a stand-alone piece of music, it is absolutely terrifying. You could put this on in your house with all the lights off, and you would not leave the room. The sonics that are at work—just the odd, all the weird spoken vocal bits that aren’t really words. And the drums that they use, that deep kind of rumbling effect that they have… It just doesn’t sound like any other record, ever. Although they did fantastic work after it, this is the pinnacle. I’d have given up if I was them, after this. Because you know you’re not gonna do any better. I could only imagine when they finished recording this and played it for [Dario] Argento, he must have been rubbing his hands. You can’t see even a still from that movie without thinking about the music. I can’t imagine any other music working in the film with those visuals, they way that does. My friend Josh always says, you could put that music over any film, make it like 10 times better. AVC: I have this song as my wife’s ringtone, so when she calls me, it makes whatever I’m doing automatically terrifying. SH: It’s a really disturbing piece of music. It sounds like madness. It sounds as if someone is going absolutely insane while you listen to it, which is brilliant. They really captured this kind of spiral of someone losing their mind. That’s what it feels like. It’s cacophonous and oppressive and then it gets quiet and it blasts out at you. I’ve listened to this, I dread to think how many times, and I still love listening to it in my listening room, really, really loud. SH: Jeff Grace, hands down, one of the best composers working today—and again, massively underappreciated. The work he did on House Of The Devil, and The Innkeepers and Stake Land as well, is really amazing. And on House Of The Devil, he’s captured a mood and the film wouldn’t be the same without it. It’s an interesting soundtrack, because although it’s got throwbacks to the ’70s and ’80s, it doesn’t sound like a score from then. But it also doesn’t sound like a score that was recorded five years ago. It sits in this weird place where it’s familiar but it isn’t. It’s got lots of odd time signatures in there and lots of weird effects going on in the piano as well. It’s a terrifying record to listen to. If you want something for Halloween, play this record. And, you know, you listen to that, and then you hear his work in Cold In July—which is like this super electronic, kind of dry electro—and you can’t believe it’s the same composer. I seriously hope he gets on to do a lot more work, because he’s so talented. AVC: It seems like there’s a sort of horror soundtrack renaissance right now, between your label and guys like Umberto and Pye Corner Audio making new music inspired by John Carpenter and Goblin and the like. So doesn’t it seem like modern horror movies would be looking for more composers like this? SH: I guess my only worry would be that now everyone just wants to throw an electronic soundtrack on their movie. I did see a movie that I won’t name last month at Fantastic Fest, and the score was fantastic—an electronic score—but it didn’t fit the film at all. It felt like it worked against the film. And I wonder if the filmmakers just said, “We’ve got to have this on here because it’s hot at the moment.” There’s a place for everything, which is why I think House Of The Devil is an interesting film and The Innkeepers is an interesting film, because they are very orchestral soundtracks, and they wouldn’t have worked with an electronic soundtrack. Whereas The Sacrament with Tyler Bates’ score works a lot better than an orchestral score would have. The filmmaker’s got to have that vision of what they want. But I am really stoked that people like Steve Moore are getting to score films, and I know Umberto just scored a film. My hope is that these people and people like them, like The Haxan Cloak, are given the chance to work in film scores, because I think they do fantastic work. Someone like Haxan Cloak totally understands the sonics of horror. How he’s not been tapped to do a film score yet, I have no idea. AVC: Both of his albums are basically horror film scores. They sound like a haunted house put to record. SH: Yes, I mean you need to sleep downstairs with all the lights on after listening to that. So I’m hopeful that these people get to do things. It looks like they are. Certainly been given more of a chance. It’s certainly an interesting time. I’m not a huge fan of soundtracks that just throw songs on there. One of the few movies I really like that does that is Donnie Darko, because I think that Richard’s choices of songs fit perfectly. I’m a massive ’80s fan, so I’ve got a terrible music collection. I’m not embarrassed by it. I love Tears For Fears. But their two tracks on Donnie Darko, I can never ever hear them without thinking of that movie. So sometimes, I think there’s a place for that. I just don’t think it’s done very well a lot of the time.